Today was another great day at the Fast Company Innovation Festival. At first glance the day seemed to be a study in contrasts. This was exemplified by one talk I attended in which science educator Bill Nye and electro DJ Steve Aoki were interviewed about their work. Bill Nye is best known for his 90’s TV show Bill Nye The Science Guy, in which he explained scientific concepts to children using comedy. His new book Unstoppable: Harnessing Science to Change the World has just been published. Steve Aoki has two albums called Neon Future I and Neon Future II, and he talked about his lifelong interest in science and in the element neon. As these two men discussed their work, it became clear that art and science are complementary, not contradictory. 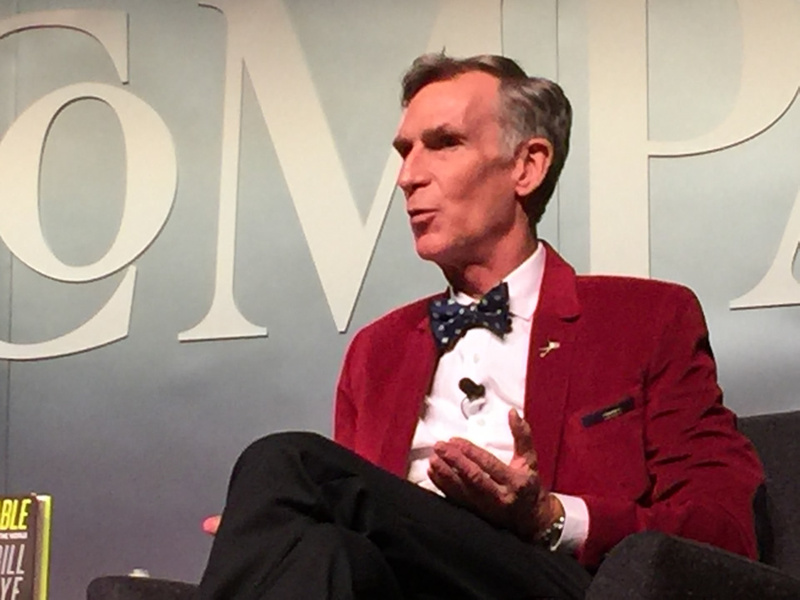 Bill Nye said that science typically requires observing something, and then explaining it using creativity. In fact, he argued that all children starting at preschool should be introduced to both art and science, as many times people’s passion in their chosen subjects starts in childhood. Another interesting contrast was between the creative folks at website Refinery29 and actor and producer Dan Bucatinsky on one side, and the material engineers at Material ConneXion on the other. Clearly the creation and distribution of original content through online media platforms is a marriage of art/entertainment and science, as is the invention of man-media materials, which sometimes involves creative ways of using waste or applying old ideas to new projects. This idea of the abstract informing the concrete and vice versa is certainly the way in which we at Calitech™ approach our work. Our data centers are state-of-the-art and have all necessary certifications, but our customers need more than data storage: they need creative solutions to solve their everyday problems and also to grow in the future. Our personalized process exemplifies the way in which we apply creative thinking to an organization and then implement the solution using the highest level of technical expertise. Thank you for reading. More to come tomorrow! Good night!